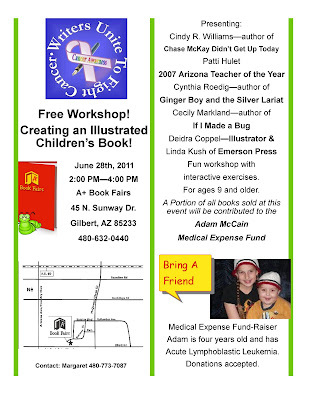 Tuesday June 28th, 2:00 PM-4:00 PM Writers Unite to Fight Cancer will present: Creating an Illustrated Children’s Book, in Gilbert, AZ. · Cindy R. Williams author of the double award winning Chase McKay Didn’t Get Up Today will teach story boarding. · Patti Hulet 2007 Arizona Teacher of the Year. She is the librarian at the Playa del Rey School in Gilbert and mentors a writing club and will instruct narration. · Cynthia Roedig wrote, illustrated & produced Ginger Boy and the Silver Lariat. She will give insight on the process from beginning concept through end product. · Deirdra Eden Coppel, author, illustrator and Enhanced Multi-Media Content (EMC) expert, will teach about choosing and hiring an illustrator, and how EMC content is going to change your career as an author. · Linda Kush of Emerson Press will bring examples of full color illustrated books from her printing press. 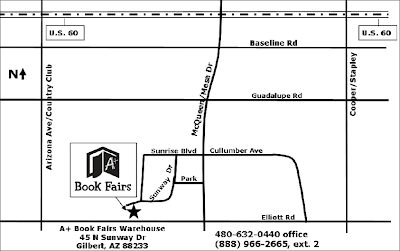 · Cecily Markland author of If I Made a Bug, and president of Inglestone Publishing will discuss publishing opportunities. One dollar from each Writers Unite to Fight Cancer author’s book sold at this event in will benefit the Adam McCain Medical Expense Fund. Adam is a sweet four-year-old boy with Acute Lymphoblastic Leukemia from Mesa Arizona. ometime during their life. Fifteen hundred people die of cancer every day. Writers Unite to Fight Cancer strive for brighter tomorrows by donating to cancer research today. We welcome all interested writers to join our group. Deirdra ~ do people need to RSVP or register for this or something? This sounds like a wonderful function. I hope you get a good turn out. Wish Ohio wasn't so far away. Thank you for the award and wonderful comment you left on my A Shade of Whimsy page!! This sounds like something I would love to participate in but can't - I live in Canada -a bit of a drive! No need to RSVP. And don't worry, if you can't make it I'm going to post my presentation here later. That sounds amazing! What a great opportunity! And thanks so much for the award! Sounds fascinating, but a bit too far from the Great White North. Uh, make that the Great Green North. It is summer time up here. This sounds great. Guess I'll be checking into your blog. I believe your notes will help me.